Hawksmoor introducing breakfast as a permanent fixture at their new Guildhall location is smart. I’ve already spent a few hundred words on how damn smart they are, so let’s look at the actual food. Smart. Looks grandiose. Unusual to find too, since most places will happily charge you £3-a-pop on coffee, to the extent you’ll only have one, and then leave feeling under-caffeinated. Chemex is smart. A word of warning though, it certainly doesn’t stay warm for long. Evil genius. There are two eggs in there. It has the same cheese/starch/meat combo hit of a McMuffin, but does it without the dirt. It’s £8.50. That’s a bargain. The ability to deliver a good eggs benny is the yardstick I’ve long used to rank restaurants in order of breakfast ability. Keeping a good hollandaise going is tough. It demonstrates skills. It’s also something you’re rarely arsed to make from scratch at home. Again, it’s perfectly executed here. One of the best I’ve had in the UK, especially if, like me, you like your hollandaise nice and vinegary. The quality of the ham helps elevate it too. A small portion, but it’s rich. Light, fluffy but with expansive qualities. I’m not a marmelade guy at all, but the dish maintains a sweet and citrussy thrall, with just enough sugar. Mrs D felt it slightly underdone, but that’s just how I like it. How did they know. Etc. etc. The difference here is the maple syrup is proper and that these are scotch pancakes. They’re not buttermilky American pancakes. Think dropscone and add some more lemon. Nice. The secret weapon. Right up there with the very, very best. It feels odd saying that you should visit a steakhouse to sample the pastry chef’s baking. If you’ve been putting off visiting Hawksmoor due to wallet restrictions, then my advice is book a table for breakfast and go for it. 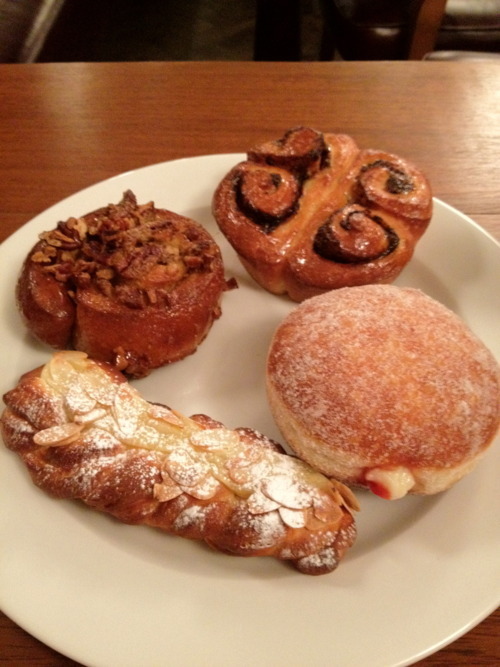 You can spend £15-20 per head and get some of the best morning food in the capital. Keep away from the steak and you’ll be fine. I’m sure the steak and eggs are lovely, but they’re not going to be as special as these Britished-up takes on American breakfast classics. and then have a quick read of our essay on why Hawksmoor are so fricking smart.